eBlast designs created for the New York Historical Society Museum Store. I also shot and edited jewelry and other items used for the eEblasts and online store. A mobile and tablet friendly site designed using HTML and CSS. The logo was created to reflect the fun, relaxed tone of the site, along with the bright color palette. Sell sheet document shot, designed, and edited for the N-YHS Museum Store. Social Media ad for The Legal Aid Society's #SteadfastForJustice Campaign. Logo design for The Legal Aid Society's Giving Tuesday Campaign. Amazon Smile social media ad for The Legal Aid Society. 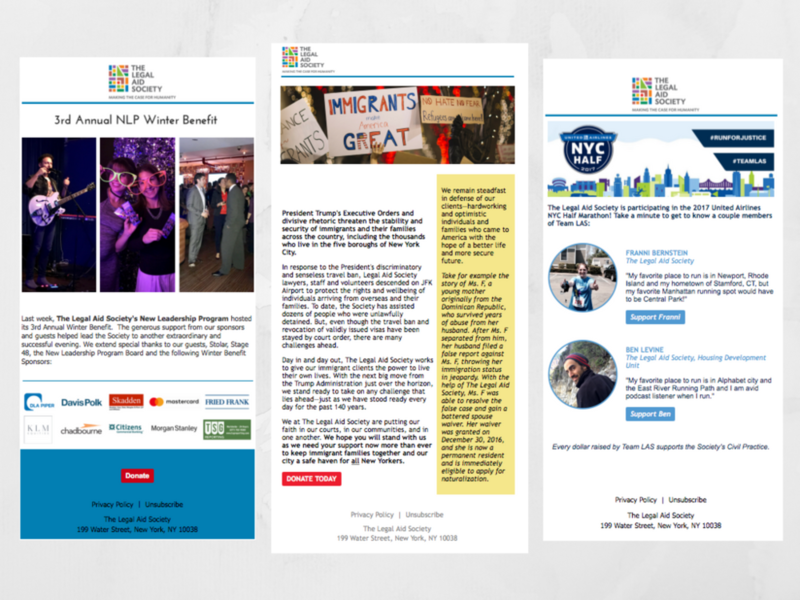 eBlast Newsletters for The Legal Aid Society. Developed the branding for the The Legal Aid Society's New Leadership Program's Third Winter Benefit including the event page, program brochure, and social media images for Facebook, Twitter, and Instagram. View the live site here.